Sun City offers entertainment and opportunities for leisure and relaxation for the most discerning of guests and those in search of casual family fun. Fun, fun, fun for the whole family! 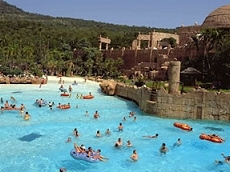 The Valley of Waves at Sun City is the most advanced Water Park in South Africa and provides hours of entertainment beneath the warm South African sun. The Roaring Lagoon is the centre of the park - and every 90 seconds a 1.2 metre wave is generated and crashes on the white sandy beach. Surrounding the lagoon a meandering river allows for a wonderful scenic tube-ride and, for adrenaline seekers there are five exhilarating water-rides to choose from including the Temple of Courage. Guests at Sun City have free access to the Valley of Waves for the duration of their stay. 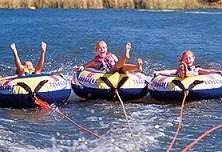 A host of watersports and outdoor activities can be enjoyed while at the Sun City Resort. Waterskiiing and parasailing can be enjoyed on the lake at Waterworld as well as daily morning and sunet cruises. Tennis, squash, horseriding and mountain biking are also all on offer and the resort boasts a series of well laid out jogging trails. For dazzling evening entertainment the acclaimed Sun City Extravaganza takes place every evening with an afternoon performance on Sundays. Be wowed with this live show! Guests can also try their hand at blackjack or the slot machines at Harlequins Casino in the Sun City Hotel. Alternatively, sit back and relax and enjoy a cocktail or sumptuous meal at a wide variety of restaurants from seafood and sushi to grills and fine dining. Sun City can lay claim to having two of the best golf courses in Africa. Both courses were designed by the well-known Gary Player and offer challenging courses in extremely scenic surroundings. The Lost City Golf Course is a unique experience and offers spectacular views across the bushveld. Also to be noted are the use of bunkers and extensive water-features - and at the 13th hole 38 crocodiles await. The par 72 course at the Gary Player Country Club is home to the annual Nedbank Golf Challenge and the tree lined course is a challenge to both novices and professionals. The pro-shop, putting green and health spa are open 7-days a week.